I have sent out an email to everyone with the exception of Steven Wilcox, Jr., Mike Roseberry and Matt Gewain (I don't have valid e-mail addresses for you) which has the Draw Table and Pilot Score Cards attached. Please verify you can access your personal scoring portal. As I'm writing this Weather.com is calling for Saturday; ' Cloudy with light rain in the morning …. them becoming partly cloudy. High around 65 F. Winds NW at 10-15 mph. Chance of rain 70%'. Sunday; 'Partly cloudy skies in the morning will give way to cloudy skies during the afternoon. High 69 F. Winds SW at 5 to 10 mph'. Well we're not going to let a little precipitation spoil our weekend of flying, so we'll have our pilots meeting at 8:00 am as scheduled and start when mother nature allows. Currently on a rain delay. Two rounds completed. Launches are high due to weak lift conditions so far. Wind started almost calm today and by the time rain got here some were considering moving away from their lightest planes. This is my first 5J contest. I am a poor judge of height going over 200 meters on both of my flights. Top guys seemed to be targeting around 150 for these conditions. That's it, I'm going home and relaxing. For you guys that want to know 'everything'. Results after 10 preliminary rounds. Results from 3 - 15 minute flyoff rounds. The winners; first place-Mike Smith, second place-Ali Khani, third-place Steve Willcox, fourth-place Brad Juntunen, fifth Place Randy West. Last edited by tim_j58; Mar 24, 2019 at 05:59 PM. Most of the Arizona contingent had a good time at the CVRC F5J contest and the social time on the field and at meals in Visalia. The fly-offs had exciting launch tactics as it looked like everyone tried to follow-the-leader but nobody wanted to be the leader.......... led to some low launches and impressive (mostly) flying on display. Nobody landed in the water and we had fun with our foamy floatplanes. Thanks to CD Tim Johnson and the CVRC crew for hosting this one. I had a blast. We had 8 NorCal guys there: me, Bill Curry, Ron Vlastelica, Lou Fox, Bob McGowan, Dale Thompson, Dale Olstinske, and Fred Weaver. And even better four of them had never flown in a Tour event! The Fri tri-tip BBQ hosted by Dale O. at his super nice RV was a ton of fun. Dale, thanks for opening it up to everyone at the field. Thanks to Ron V. for making a run to the supermarket with me. And Rick Johnston even had ice cream to go with the pies! I'm pretty sure everyone had plenty to eat and drink. We had quite a range of flying conditions over 2 days. This was a very good and tough flying test for most of us. 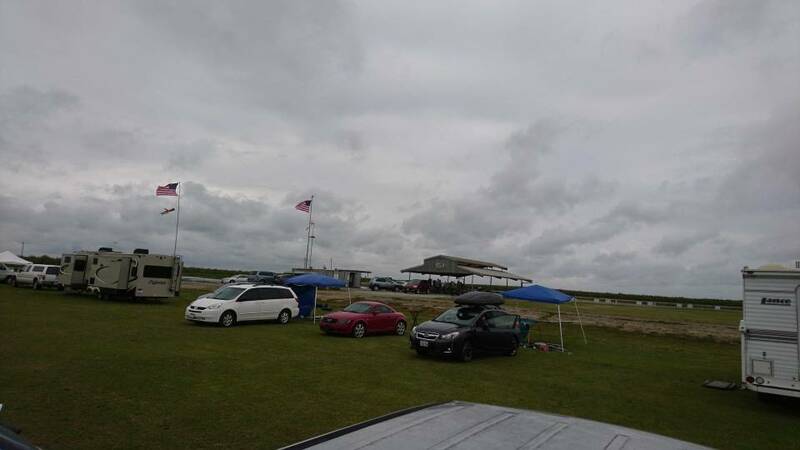 The low fog/clouds threw us a curve early on Sunday but by the fly-offs the weather was sunny and warm. All in all a great weekend. Can't wait to return here in June. Really fun event!! Thanks to everyone who worked hard to make it happen! The F5J USA Tour season standings are now updated with this event and available via this page. Thanks Ali for the video....really enjoyed it! After watching it and recalling what I observed during the contest, I must say that a number of us are tending to be too far out at 10 seconds on the landing approach, resulting in quite a bit bit of drama in the landing zone (crossing lanes rapidly over the grass, late landings, punching plane down before reaching pin, dodging plane in landing zone). I'll admit that I started adopting that habit on Sunday and will be working on avoiding that in the future.